You are currently browsing the Travel category. Leaving Ranomafana National Park we continued south on Route 7 towards the town of Fianarantsoa. About 15km before we got there we started seeing hoards of people walking or pushing carts carrying local produce, chickens and ducks to sell at market day in the town. It was very comical watching 4 boys riding on a go-cart while sitting on bags of rice. 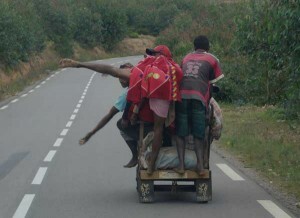 In true Malagasy sense of humour they started showing off, doing tricks and leaning off the side of the cart while flying down a hill at 50km an hour. After lunch in Fianarantsoa we headed towards our next park called Andringitra National Park. 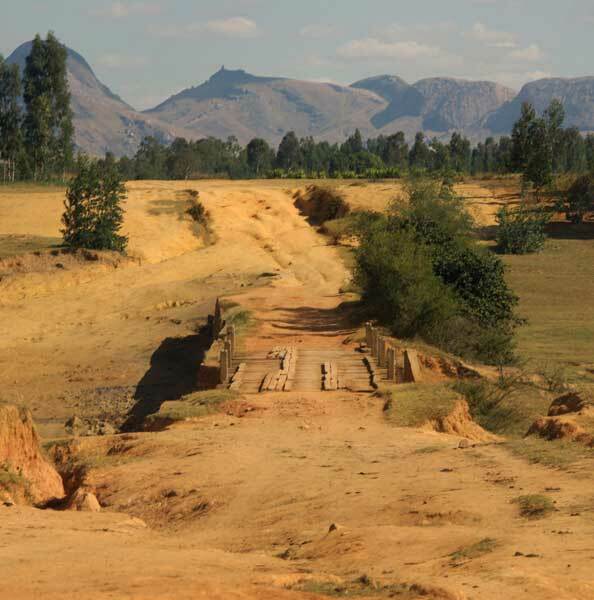 The road to Andringitra is a 2 hour drive that takes you through beautiful rolling hills covered in rice paddies and tiny villages, but the road is a real dirt track and I would recommend doing it in a 4×4 or a vehicle with a high ground clearance. Andringitra is probably the most scenic park I have ever hiked through. 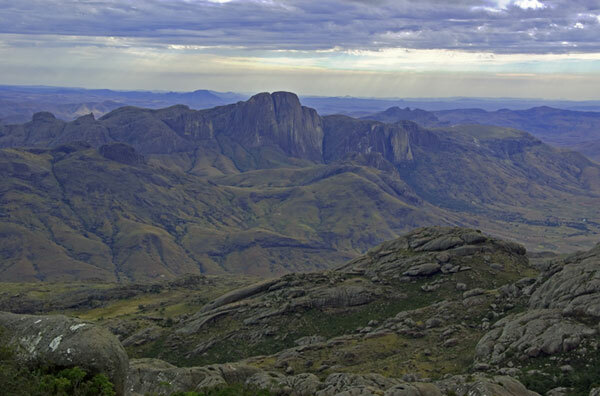 It is subdivided into three ecosystems growing around a huge granite outcrop, which is the second highest mountain in Madagascar at 2,658m above sea level and offers some of the best landscape photography on the island. The ecosystems are made up of lush tropical forests at the base of the outcrop, Montane mountain forest on the sides and high altitude vegetation on the top. 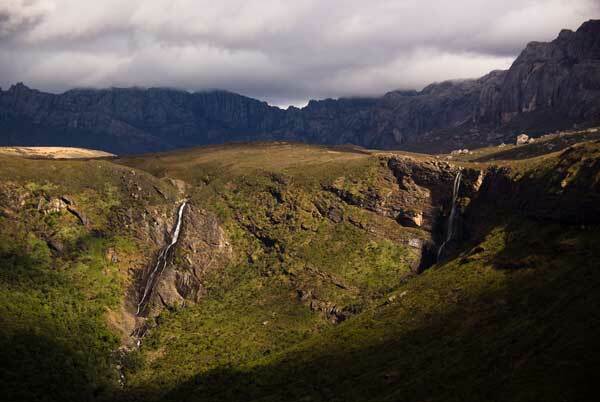 It is a fairly difficult but rewarding hike as you ascend up the mountain alongside two beautiful waterfalls to your first camp at the top of a plateau. The camp is made up of a small wooden hut next to a beautiful pool of crystal clear water where you can have a refreshing swim and cool off. This hut is normally a sleep over stop before you carry on to Pic Boby which is the name of the highest peak in Andringitra. The views of the valley below are spectacular. 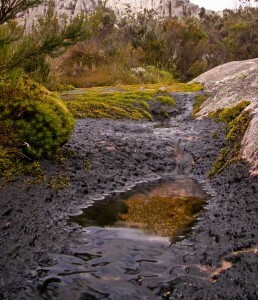 From here you travel back to the plateau camp where you should spend another night before continuing along the top of the plateau through large granite boulders that are covered in islands of moss and lichen with tiny streams of rain water. You can spend hours exploring the almost lunar landscape before descending down the other side of the plateau giving you a better view of the two waterfalls and the peak that you have just conquered. If you are interested in landscape photography or are a keen hiker Andringitra National Park is a must and you would be foolish to skip it. Give yourself two nights hiking within the park as you will regret rushing it with just one night. 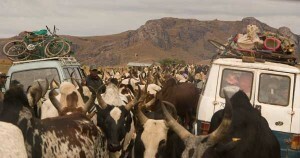 taking their Zebu on a few hundred km trek to the capital to sell them in the market. For the next few hours we where caught up in Zebu jams waiting patiently or pushing our way through hundreds of animals, herd boys and taxis. Arriving in the town Ranohira we checked into our hotel for the evening to get some much earned rest before our big hike in Isalo the following morning. Isalo National Park is made up of a wide variety of terrain including sandstone formations, open grassland, deep canyons in thick forests and a beautiful clear spring water oasis surrounded by palm trees. We started our walk through landscape that looked similar to the American Grand Canyon with open grassland and huge eroded formations. There were a lot of burial tombs dug out in the cliffs, which gives you an eerie feeling that the local ancestors are watching you. After about 3 hours of hiking you are rewarded with a stunning oasis of palm lined pools and little waterfalls where you can have a refreshing swim and some lunch before carrying on into a large canyon filled with thick vegetation and fast flowing streams. One of the nice things about Madagascar is that the wildlife does not feel threatened by people and you can normally get to within a few metres of birds and mammals before they start moving off. 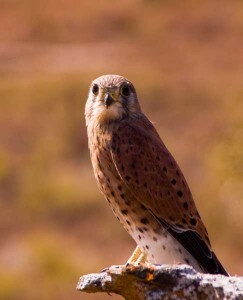 We got within 1 metre of a Madagascan kestrel which was resting on a rock, he was so relaxed he even tucked one foot into his chest and closed his eyes while we just sat watching him. We also saw ring tailed lemurs and red fronted brown lemurs around the campsite who where quite happy to pose for photographs. 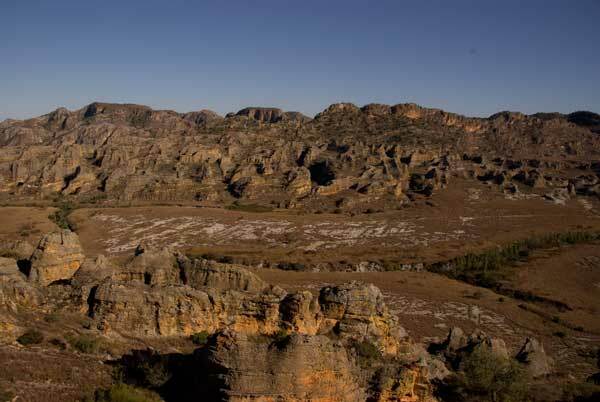 Isalo National Park has a beautiful campsite within the canyon and is perfectly situated for you to spend many days hiking in the surrounding area. The next installment we visit Beza Mehafaly, Tulear and Ifaty. Posted 9 years, 7 months ago. Madagascar is a place unlike anywhere else in this world with its unique mixture of fauna and flora that seems to have evolved on a completely different level to the rest of the planet. It contains around 5% of the worlds wildlife with 80% being completely endemic to the island which is very extraordinary as it is only the 4th largest island in the world and slightly bigger than France, but the diversity of animals and plants on the island is out of this world. Apart from nature its landscapes and spectacular views rival the best in the world from lush rainforests with cascading rivers to dry arid deserts with rocky moonscape mountains being just the start to the different terrains it has to offer. I was fortunate enough to spend a month on this magical island and to say I was impressed is an understatement, I was blown away. 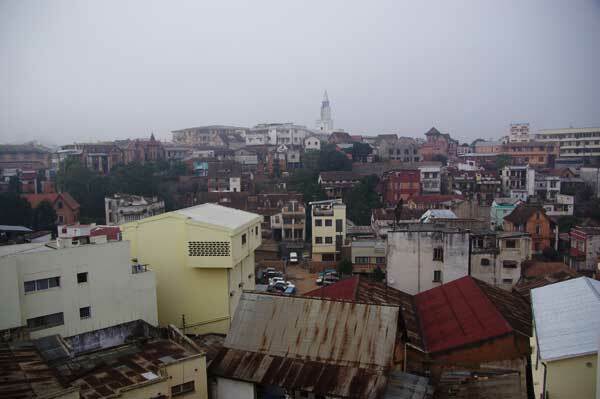 Landing in Antananarivo, (Tana for short) is something you need to brace yourself for. As soon as you step out of the airport the noise, smells and sights hit you like a ton of bricks. The city is alive, bustling with swarms of people, cars and confusion all packed in along colourful stalls which sell everything from fruit and meat to bicycle parts, centred around a maze of old buildings, decrepit houses and shacks. It’s very overwhelming at first and you are not quite sure what to think, but you soon settle down and join in with the flow of things. 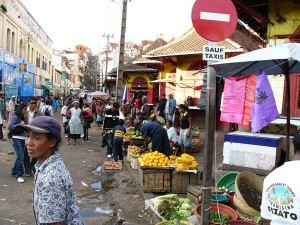 If you are on a tight schedule I would say you would not need more then a full day in Tana. Some of the more popular attractions are the Royal Hill of Ambohimanga, the Queens Palace and Tsimbazaza Zoo. Heading south it is well worth a night in Ialatsara Lemur Forest Camp. Ialatsara Lemur Forest Camp is a fairly small reserve located on Route 7 south of Tana. The accommodation is made up of beautiful rustic open sided log cabins with fold down canvas flaps. The beds in the cabins had the most comfortable mattresses we experienced in Madagascar and it was really nice lying awake at night listening to the noises of the forest with a cool breeze on your face. 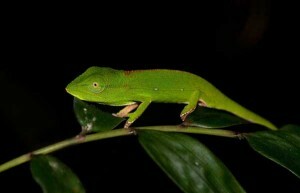 At night we went in search of Chameleons which proved to be a challenge at first as they are very camouflaged, but once your eyes become accustomed to what you are looking for we found dozens of them. 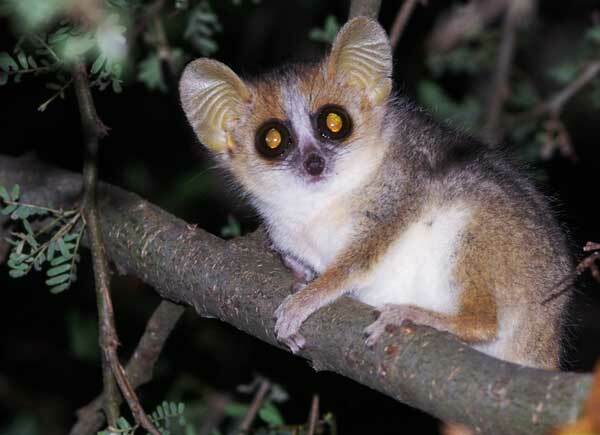 On top of that we also saw a mouse lemur which is about the size of a hamster and has one of the cutest faces you have ever seen with their pointy ears and big round eyes. The next morning we went in search of the Milne-Edwards sifaka and found 3 of them after a fairly easy 2 hour walk. Milne-Edwards Sifaka’s are an arboreal, diurnal lemur species (active during the day and solely live in trees). Their diet consists of leaves, fruit, seeds and flowers. They are a fairly large lemur dark brown to black in colour with a light brown back. We spent about 20 minutes with them before moving on. Shortly afterwards our guide found a Brookesia chameleon, which is the smallest chameleon in the world about 2-3cms in length. They are extremely hard to find given their size and brown colour making them very camouflaged and usually found hiding under bark and leaf litter. After a few photographs we headed back to camp for breakfast and packed up. 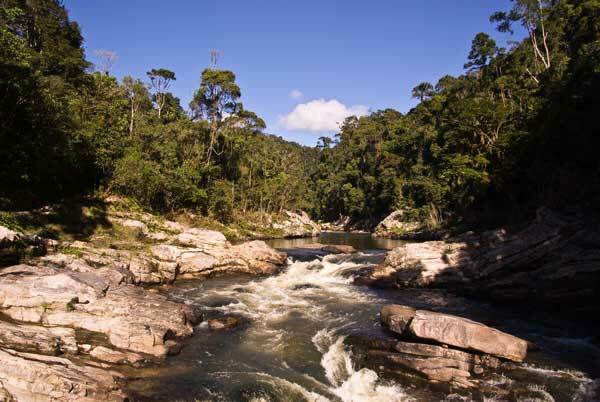 Ranomafana National Park is one of Madagascar’s best known parks. It became a national park in 1991 following the discovery of the golden bamboo lemur in 1986. 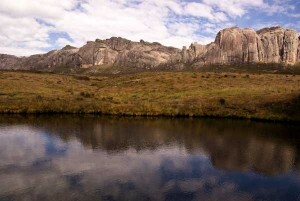 The park is situated in a very rich montane or high altitude forest. It looks very similar to a rainforest having thick lush vegetation growing on steep mountain sides with fast flowing turbulent rivers and cascading waterfalls flowing down the valleys which provide stunning panoramic views. 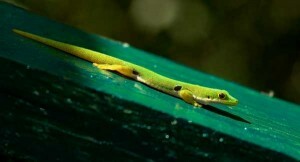 Ranomafana supports a rich diversity of plants and wildlife. On our expedition we were lucky enough to see red-fronted brown lemurs, black and white ruffed lemurs, small toothed sportive lemurs and the very rare golden bamboo lemur with which the park is famous for. On top of that we got great shots of the very colourful daytime gecko plus loads of other interesting reptiles, frogs and insects. One night we went on a walk and came across a Malagasy striped civet sitting in the middle of the path not bothered by us at all. 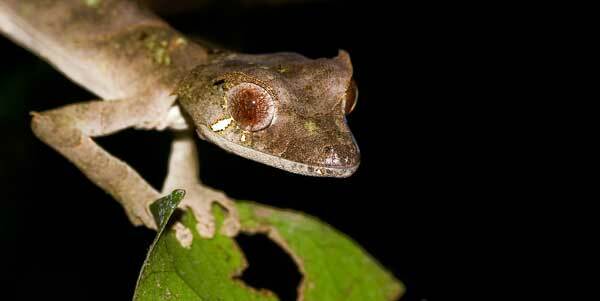 I also almost walked into a leaf tailed gecko which was hanging on a leaf in the middle of the path. Regarding hiking, I would suggest that your fitness levels should be fairly good as the hikes can be strenuous with steep paths up and down the mountain sides and high humidity. I would recommend spending 3 nights in Ranomafana, spending the first and last night in one of the many hotels next to the park and the middle night camping within the park at the halfway point of the main hiking trail. The trail can be done in a day, but gives you little time to explore the forest. My next instalment will be on Andringitra and Isalo National Parks.